Christmas calendar on the eight of December shows this little and beloved doll from the 1950`s. She lived in Lapland, but she had to move from there with her lady. They moved from Lapland because of the lady´s work. The elves never move to the South. Lucky them! 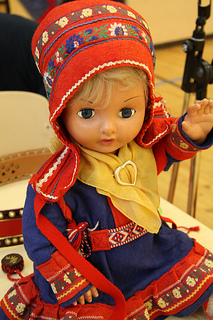 A doll dressed in a traditional Lapland, Sami, costume is a dear friend of an adult woman. Photo of Santa Claus.